From this position of consciousness you appreciate things a lot more due to seeing how much of a depth or relevancy someone of object or thing is going through just to relate to you consciously or vibratory or energy. Appreciation in this regard then starts a trend of progression appreciating everything in the same but different way, deeper understanding brings about the chosen conscious awareness and some, adding to depth and understanding so can relate in a deeper dynamic way. what becomes of me becomes of all in my conscious positioning. Everything that is deeper relates back to the physical matter on surface so everything that is present in matter is relative there for beyond it, has to be to incorporate the aspects i.e...depths of the mater streams from energy to matter through layers of physics or dimensions, where emotions, vibrations are prior to manifestation of matter in physical so the emotions or vibrations of energy has to incorporate and add to the matter in the physical we see today. intention and understanding either flows, holds up or runs on from the point of position. As I constantly maintain central position less hold ups, less run on’s are noticed. The centred self is aligned with my trend of life. Giving weight to enhanced perception in all spheres in alignment be it by insight, instinct, sound, vision, thought so that there is no catch up to do or potency release (slowing down) to occur. The central self is one whereby you are yourself and within the parameters of your perceptional common sense, reality of that which is your standard and others. Energy or object, matter, someone or something cannot be changed by another. Honour and Respecting that is the Harmless approach to inspire that which is to change or adjust by means of their intent to something or some aspect that relates too the direction of the self. Human nature is to adapt too something that is and adjust or change it to be something other than its purest form so it transpires into by means of constant trends that which it is and we adjust it to what it is perceptionally to ourselves. By coming at it differently and honouring it for what it is and doing but sending a message to say you can do it this way in the direction of our self intent by means of vibrational resonance it then can perceive and inspire itself towards its believe and its understanding that to which is different to our own but within the framework of its understanding or positional relation to the whole of its arena. The change occurs by means of its own intent, magic, illusion, manifestation. The belief in us transpires the whole picture by means of our resonance to adjust and amend, rather than find the seed of matter stream and understand its process or programme and adhere to it then inspiring new vision of direction to re-position or re-align towards a continuous global, Universal aspect. As all in everything is the same but different in terms of approach and direction therein lies a question if I become the purest I can be then all that surrounds me becomes pure by its own intent. As the progression of self transpires so does it all. The position of consciousness relates to the aspects of self in the focal point I give myself and so does all others hence differences in opinions, thoughts, understanding, awareness occur. If all of matter is in alignment with all then a global relevance is apparent to be the group direction of the planet as we do she does. Changing the face of things, acceptance of what is to accept that the current situation in everything is perfect and correct, the re-alignment occurs with all the thoughts and constants towards the direction that we perceive or see ourselves and surrounding by means of our constant trends built by our individual incarnation over lifetimes. Older souls can comprehend at greater depth as the knowledge and understanding surpasses the old. Evolution and Progression. The instruction for direction though can be any towards polarities of perceivably good or bad, right or wrong, yes or no, adjusting the realignment by means of acceptance in the reality can then inspire a new programme of means of way forward in intent, awareness, perception or belief inspiring the energy stream to wards adjusting to that intent or insight. The vision is greater than the reality. So once the intent is given confidently then the energy can move into position constantly by means of continuous intent. from you and then duly believe those aspects to become more inline with the growth of your conscious understanding, growth is slow in comparison to time but fast in comparison to all that has shifted to meet our requirement and the awareness, perception and belief of this progress increases through the cycle of events and there are major and minor steps achieved at certain intervals of the planetary cycles for each year you'll find bits increase around the same time every month and decrease around the same time every month but in different spheres of the self, astrology and lunar cycles are relevant as an external relevance to this, perceptionally. There are an infinite number of streams relating to aspects of self presence. As energy manifests into being and sustaining to direction of light, thought, intent, vision and dynamics. Energy shifting positions in light directions moving and adjusting to become more evolved than before. Building and relating to the energy cluster (soul) towards vibration mannerism’s to progress the vibrational fields of the self. 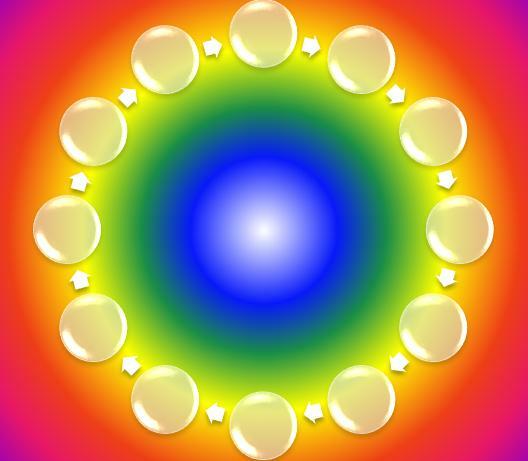 Correlating with the Emotional energy fields, chakras, being resonant with conscious interaction, thoughts and presented by means of action in physical matter movement conscious re-action or action. A single aspect of the self runs through each direction, cycling around evolving and developing. As we adjust by means of intent or thought of direction or not we inspire a route map of next progressive matter streams of energy. As energy does what energy does it progresses towards direction of intent, unconditionally? 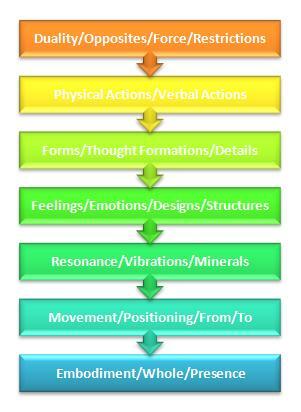 Energy, Vibration are unconditional plateaus, emotions relate to cross over for bridging interacting with polarity, electro-magnetic fields (Aura), each plateau has its own mentality, to understand how energy, vibrations are functioning a neutral, unconditional presence of mind is required to align though with comprehension whereas a more linear, segmented mind is align with polarity references or understanding to emotional and thought forms, correlating to understand in segments or sections the entire self. Consciously we only are present with a percentage of any given moment but have capacity to roam and scan aspects of all this to then consciously relate an overview of self and interact with the positions or areas that require attention generally the energy will present itself by means of awareness once given intent to become more aware.